During Merlimau by-election, Dap Negeri Sembilan Rasah Member of Parliament Anthony Loke frequently appeared at Pakatan Rakyat political talk. He was just like an ancient knight of justice. The reason why I associate Anthony Loke with Robin Hood is because of his name, Loke Siew Fook. The pronunciation of his name in Cantonese is almost same as Loke Siew Fong, a fictional character of Kung Fu novel. 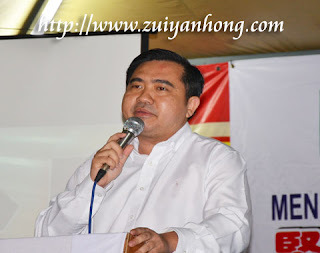 Anthony Loke is an expert of physiognomy. According to him, one of Malaysia national leaders looks ominous. Within 3 years of his service, more than ten legislators and the King of Hell have a date one after another. Anthony Loke really looks far ahead. In order to ensure a better future, Malaysians should seriously reform and change.